Most sinningias are dormant during the cold part of the year. A dormant tuber, if dry, can survive sub-freezing temperatures without harm; how much below freezing depends on the species. A few species, such as the miniatures, may not tolerate freezing, but I have not tested this myself. At various times, I have complained that I had too many plants. Too many to water. Too many for the room I had available in my back yard. At eight-year intervals, Mother Nature gets fed up with my complaints and resolves to help me out. In December 1990, we had a (for California) ferocious freeze, with a week of temperatures around freezing, during the day, and around 20 F (-6.5 C) at dawn. This laid waste to my collection, killing many sinningia tubers. I started new plants from seeds and cuttings. They grew. Eventually I began to complain again. In December 1998, we had what I called the Four-Night-Freeze, with morning lows of around 28 F (-2 C). This killed some plants (such as Nematanthus fluminensis and Paliavana prasinata), but the sinningia-tuber mortality was no greater than a normal year. I started new plants from seeds and cuttings. After a while, I began to complain again. We had one night of 29 F (-1.5 C). 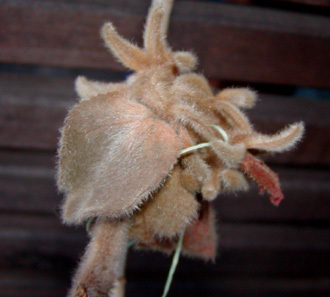 The next morning, the leaves on all my vanhoutteas and paliavanas were hanging vertically, completely brown and limp. All the leaves on Nematanthus crassifolius were dead too. Still, I had been through this before. The vanhoutteas had come back from defoliation in previous years. Many of the sinningias still had their leaves. This picture shows Sinningia hatschbachii after the December cold shock. All the leaves are dead, and the flowerbuds are out of action, but the stems still look intact. Note the trailing strand of green dental floss on the stem to the right. Until the cold wave, I was planning to hybridize with this plant. This time, five nights of temperatures around 26 F (-3.5 C). Sinningia gerdtiana had kept its leaves and even a flower or two through the December freeze. The January freeze put an end to that. Almost every leaf on every unprotected sinningia in the yard was dead. It was quite possible that many of the sinningia tubers were still alive, but there would be no way to tell until warmer weather returned. The vanhoutteas and paliavanas, with no tubers, looked dead. 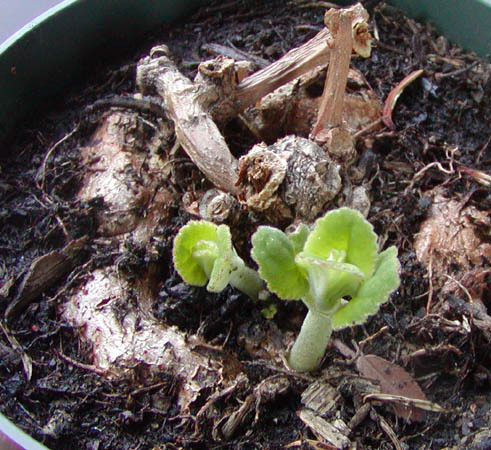 This picture of Sinningia hatschbachii (the same plant as in the photograph above) was taken after the January freeze. Most of the leaves are gone, the flowerbuds are history, and the stems are toast (thermally incorrect!). This in spite of the plant's being brought under cover of the roof after the initial freeze. Wise up, plants: if you're going to bloom in winter, be ready for a little cold! The vanhoutteas and paliavanas (and Nematanthus crassifolius) showed an ominous symptom: the bark had separated from the interior of the stem as the latter shrank. Pressing on the stem, one felt a loose, papery outer layer and then the inner cylinder of the stem, detached from the outer layer. I surmised that stems with this trait were dead. Fortunately, I had collected seed from my favorite, Vanhouttea brueggeri, in 2006, so even though my outdoor plants were gone, I had some seedlings coming along indoors. As it happened, I also had one seedling left of V. pendula and V. lanata, so I wasn't completely broke. Some of the sinningia tubers were sprouting, so not everything was dead. S. douglasii, S. polyantha, and S. ramboi were three of the earliest. S. ramboi seems particularly durable, since it had already sprouted in January, and the freeze didn't damage the sprouts. Sinningia gerdtiana looked dead in January, but some of the stems were now showing green leaf buds. 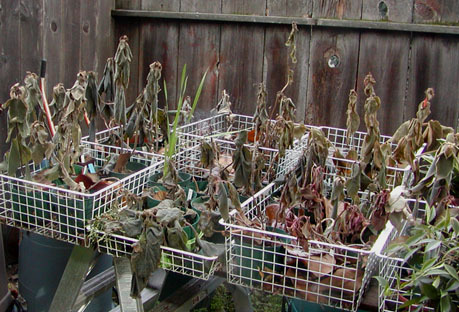 I collected the dead-looking plants onto a bench that I called the Morgue. For the next three months, I regularly inspected these pots, looking for any signs of life. Already, some of the plants in the Morgue had revived. One of the remarkable patterns was that the Morgue was full of S. reitzii and S. "Black Hill" plants, but only the latter were coming back from the brink. None of the S. reitzii plants ever revived, even though some of the reitzii hybrids survived without damage. Most of the "Black Hill" plants did come back, showing another distinction between the two types. Unfortunately, some 25-year-old tubers of S. 'Peninsula Belle' (S. reitzii x lineata) were among the casualties; the tubers remained firm, but never revived. Meanwhile, S. ramboi was already in bloom. In something of a surprise, my Columnea schiedeana plant in a hanging basket under the patio roof, which had appeared to survive the freeze, gradually lost all its leaves. I would continue to water it for another two months, but it was dead. This is one of the hardiest of columneas, but obviously not hardy enough. Two plants in the Morgue I had totally given up on now had sprouts: S. brasiliensis and S. mauroana. The latter was growing quite rapidly. Meanwhile, freeze survivors were in bloom: S. lineata, S. polyantha, and S. douglasii. At this point, I started emptying the Morgue, dumping the plants which were obviously dead, like the sinningias with mushy tubers, and the several dead plants of S. schiffneri. It was obvious now that not one of the vanhoutteas or paliavanas had survived, not even the V. calcarata I had planted in the ground. I had given up on my old S. macrostachya tuber, since there had been no sign of life from it since the freeze, more than four months ago. But now there was a tiny sprout from the tuber, and in another week, there was a second. This was the last plant rescued from the Morgue. All the rest were really dead. Meanwhile, more freeze survivors were in bloom: S. leucotricha, S. leucotricha x cardinalis, S. insularis, S. glazioviana, S. reitzii x cardinalis. The following table shows what survived and what didn't, and under what conditions. "Unsheltered" means out in the open, away from the house -- that is, not under the patio roof. It is clear from the results that this roofed but unenclosed area of the yard provided substantial protection. A few plants are listed under both "Unsheltered, died" and "Under the roof, survived", indicating that for them, the shelter of the roof was crucial. The temperature of 26 F (-3 C) seemed to be an interesting point on the Sinningia hardiness scale. About two thirds of the plants survived and one third didn't. The inheritance of cold tolerance is also interesting. S. reitzii was killed by the cold, but most of its hybrids were not. Cold tolerance is probably governed by several genes, so it is probably not a simple recessive/dominant calculation. Also, other conditions may affect a plant's cold tolerance: S. polyantha tolerated the cold just fine, as long as the soil was dry, but a tuber in a very rainy winter (2005-2006) rotted even though temperatures never went below the mid-30s. This table was most recently updated in June 2007, and reflects the situation at that time. A question mark beside a name indicates uncertainty about the identification, not about its survival. The shoot buds of S. ramboi survived the freeze, even though it was unprotected. The shoot buds of S. lineata survived and came into bloom in the second week of April 2007. This latter tuber is 30 years old, so it survived the 1990 "Big Freeze". I always assumed that proximity to the house was the deciding factor in the survival of plants close to their hardiness limit. The extra degree or two from the house wall could make all the difference. I have a patio, part of which is covered by a metal roof. The roof extends 20 feet [6.5 meters] back from the house. The area under the roof is open on three sides, with no protection from wind or cold air. The main function of the roof is to protect the plants under it from direct sunshine. It is hard to see how the roof could possibly provide any protection from the cold. And yet: the pattern of death was absolutely clear and dramatic. Almost every gesneriad under the roof survived. 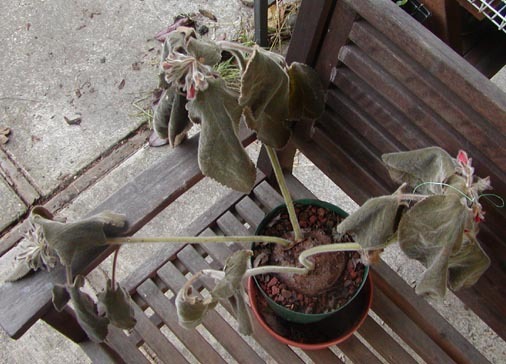 Almost every gesneriad (see the exceptions not under the roof either died or lost all its leaves. Plants against the house but not under the roof were killed or heavily damaged, while plants further from the house but under the roof were not. Plants near the edge of the roofed area were killed or damaged, while plants just inches away but completely under the roof were not. Here's the only explanation I can come up with. Air within the ground zone (within, say, 12 feet of the ground) gets cold when the warmer air in that zone rises into the colder air above. The roof slows the escape of the warmer air, keeping the area under it a few degrees warmer. This explanation is plausible, and might even be true. Therefore, get thee a roof for thy plants, and heedless be of the sides! Unless you get strong winds at the same time, in which case you have lots of new compost. Two sinningias planted in the ground did not show the usual pattern of dead leaves. They are S. 'Anne Crowley' and S. (lineata x reitzii) x conspicua, which are under the flanks of the Meyer lemon tree (also undamaged). It may be that the tree branches and foliage act as a roof and afford some protection from the cold to the plants underneath them. but, according to Carol Schreck, woman does! Aloes etc. Aloes, gasterias, haworthias. See discussion of Aloe ferox. Tecoma (Bignoniaceae) T. stans lost all its leaves but is leafing out [March]. My neighbor's T. (or Tecomaria) capensis took a lot of damage but is coming back from the base. 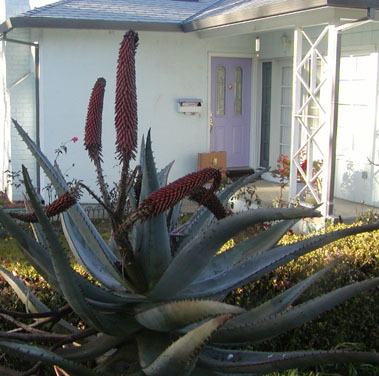 The Aloe ferox in the front yard is a veteran of 1990, so it's in good shape. However, it blooms in mid-winter, and the flowerstalks can't take the cold. Even a light freeze zaps the flowerstalks. The picture shows that three of the flowerstalks had already collapsed, but two were hanging on, even though the tops looked damaged. A couple of weeks later, those two collapsed as well. The plant itself is in good shape. A little cold is the least of the worries for this species. One site had a cool picture of Aloe ferox in habitat, with elephants grazing nearby, but it went away, alas. At any rate, all those spiky points on its leaves made sense. 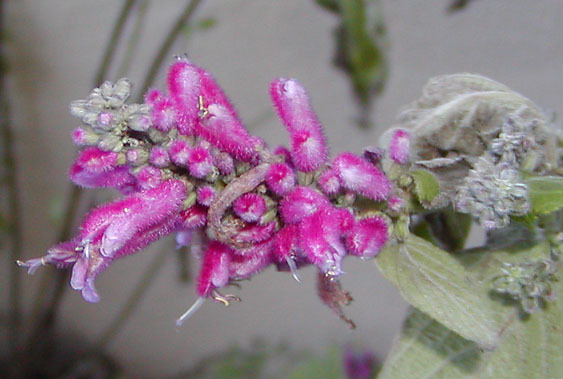 This picture shows Salvia iodantha in bloom in January 2007, several days after the hard freeze. There are a variety of incompatible pictures on the internet of Salvia iodantha, so this may or may not be the true species. Betsy Clebsch's excellent book on salvias (from Timber Press) doesn't show a closeup, so I don't know whether what I've got is the true Salvia iodantha, but it sure is pretty.